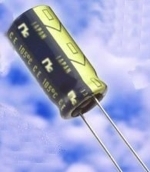 NIC Components is pleased to announce the addition of NRB-XZ series of miniature radial leaded aluminum electrolytic capacitors to its expanded radial leaded (LDD) capacitor offering. NRB-XZ series is supported in voltage ratings from 160VDC to 450VDC, with extended lifetime ratings up to 12,000 Hours @ +105°C (11 years operation at +75°C). Supported in 10uF to 820uF capacitance values, the NRB-XZ utilizes high magnification aluminum foil, to reduce the case size (>20% size reduction from established product series), while maintaining long lifetime performance over operation temperature range of -40°C to +105°C. High ripple current ratings (+105°C), up to 2.23Arms/120Hz and 4.46Arms / 100KHz make the NRB-XZ series ideally suited for use in both primary and output filtering circuits of power supplies, power adapters and lighting applications. RoHS and REACH compliant and compatible with PB-free wave soldering. Unit pricing from $0.19 to $1.30 each in production volumes. Please contact NIC for evaluation samples and to review your requirements.